I've got a video cassette of the red marked titles. 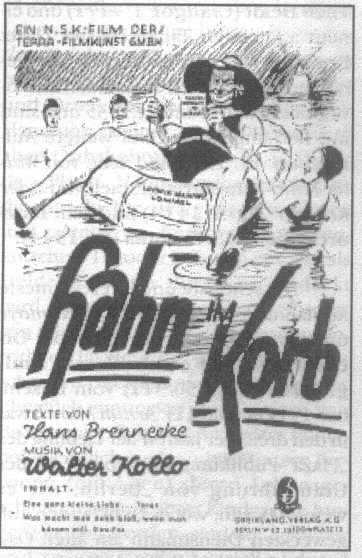 Director: Heinz Paul; Actors (among others) Ludwig Manfred Lommel, Hilde Schneider, Grete Weiser, Frank Zimmermann (I). An insurance agent has to force contracts to the guests of a seaside resort for not being fired. The bathing physician arranges a confusion by introducing the agent as the rich "Cocoa-King". The confusion resolves when the real "Cocoa-King" appears. Director: ??? ; Actor (among others) Ludwig Manfred Lommel. A man slaughters his neighbor's hen when it keeps coming onto his property. When a policeman comes to his home to inquire about the disappearance of one of the man's in-laws, he thinks the officer is looking for the hen killer. Actors (among others) Ludwig Manfred Lommel, Anneliese Würtz and Hedi Lipperer. Young Christel delivers the mail in the beautiful town Rothenburg ob der Tauber. Horst, her fiancee, works as a police officer. But Meckey, a solo tumpeter, tries to destroy their love. The great Mail Festival ends in great confusion and turbulences. At the end Christel realizes, that her loves only belongs to Horst. A touching love story with much verve and music! Actors (among others) Claus Biederstädt, Hannelore Bollmann, Gardy Granass, Erna Haffner, Carla Hagen, Karl Hellmer, Paul Hörbiger, Hardy Krüger, Stanislav Ledinek, Ludwig Manfred Lommel, Gunther Philipp.